Well, this ends my joyride, and it is time to thank the Ford Motor Company and the Performance team from Detroit. Is this car worth the cost of the SVT performance package? Well that is something that every buyer must decide themselves. The cost is not cheap, as it is almost twenty grand for the extras. I can say this, I would sure miss it if it didn't have it. If you can get it past your particular finance committee, I recommend that you go for it. IIt may sound to you like I am a salesman for Ford, but in the words of Mohammed Ali, if you can back it up, it ain't bragging. This car can back it up. Does it have faults, yes, it does. Noise issues with the tires and rearend whine, and a slight pulling to the left in the electronic steering, but all correctable. Yes, I had to fold up like a pretzel to get in, but once I got there it was comfortable and easy to drive. Even my Sweetie said it was comfortable once you got in. What really impressed me the most is how the car can be so docile and civilized and in an instant can turn into a snarling beast that eats up the terrain. Speaking of sound, the exhaust of this car is the sweetest that I have ever heard, bar none. Just the right amount of snarl. I shifted that 6 speed every chance I got just to hear the sound of the exhaust. 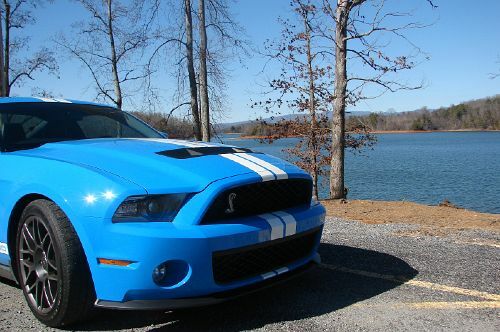 Hats off to the guys at Ford and lets not forget the old man, the legend, Carroll Shelby. They warned me I would have withdrawal and I have a tear in my eye right now, because I miss it so bad. Thanks John, Matt,Jennifer and Howard for making my Bucket list #3 come true.